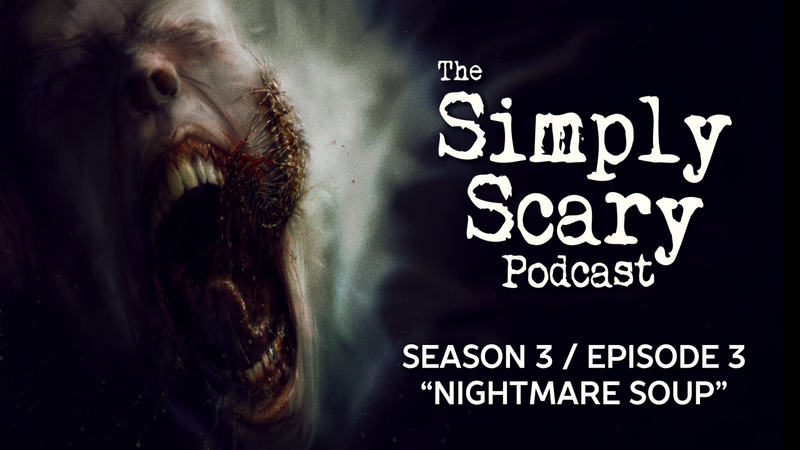 Welcome to Season 3, Episode 3 of The Simply Scary Podcast, with guest host, Jason Hill, filling in for G.M. Danielson. Turn off the lights, and turn on the dark. In this episode of The Simply Scary Podcast, we’ll be your guide through the twisted worlds and disturbed imagination of author Jake Tri. In honor of our production of the audio edition of Jake’s chilling collection, Nightmare Soup II: The Second Helping, performed by the one and only G.M. Danielson, tonight we bring to life five of Jake’s most terrifying tales, from both his first and second books in his series. If you enjoy what you hear tonight, please show your support for both indie horror and the author by purchasing a copy of Nightmare Soup II: The Second Helping, now available on Amazon.com, or at NightmareSoup.com, where you can pick up not only the digital edition, but the audiobook as well, featuring 25 sinister stories performed by G.M. Danielson himself. “Skin Soup” by Jake Tri, as featured in Nightmare Soup II: The Second Helping. Narrated by Peter Bishop, and featuring Jonathan West, Olivia Steele, and Lucas Webley. Sound design and original music by Luke Hodgkinson. “The Toothache” by Jake Tri, as featured in Nightmare Soup II: The Second Helping. Narrated by Otis Jiry, and featuring Jason Hill, Steve Taylor, and Jordan Lester. Sound design and original music by Luke Hodgkinson. “The Dancing Corpse” by Jake Tri, as featured in Nightmare Soup II: The Second Helping. Narrated by Kristin Holland, and featuring Aaron Ordover and Aiden Ordover. Sound design and original music by Luke Hodgkinson. “The Farm” by Jake Tri, as featured in Nightmare Soup: Tales That Will Turn Your Stomach. Narrated by Jason Hill, and featuring Ashley Tolfo and Otis Jiry. Sound design and original music by Luke Hodgkinson. “Pretty Pumpkins” by Jake Tri, as featured in Nightmare Soup: Tales That Will Turn Your Stomach. Narrated by Lucas Webley, and featuring Aaron Ordover, Aiden Ordover, and Nikolai Porter. Sound design and original music by Luke Hodgkinson.